Laser Tag Facts – The truth about Laser Tag equipment! spread by misinformation and fake news. It’s time to correct the record. Most other companies offer over-the-head laser tag ponchos. Why? Because they’re cheaper and easier to make. However, it’s the operator that feels the downside: longer kit-up times, complaints from customer from pulling hair, earrings, and glasses – as well as sore shoulders from hard shoulder plates. In 2006, in conjunction with professional seamstresses, Zone developed a highly comfortable vest design that clips easily from the front. The vest fits the form, while the weight rests more comfortably over the shoulders without hard shoulder plates. Don’t believe the alternative facts. Vests are quicker and easier to put on, saving you time and money. They are much more comfortable and don’t catch on hats, glasses, hair or earrings. Give your customers the best laser tag experience. Some push the idea that laser tag manufacturers are the same, that they all innovate equally. Since Zone’s first system, developed over 30 years ago, we have been pushing the industry forward with new innovations and technological advancements. Don’t believe the alternative facts. Every innovation has been painstakingly researched and developed by Zone – and then copied by the competition. This is a list of industry firsts that Zone implemented—in 1991. Imagine what we have done in the 26 years since as we have grown and technology has advanced. Some companies claim that there’s no point to a screen on the phaser. They say they are useless and distract from gameplay. They say that phaser screens break. Don’t believe the alternative facts. Only those who don’t know how to implement a phaser screen will argue that it’s not needed. Zone’s Helios Pro touch screen is housed in anti-shock, antistatic rubber housing and protected by a solid plastic plate—in addition to the built-in vandalism abuse protection. Millions of game hours have been played on Helios Pro with near zero breakages. Since 1987, with the development of Phasor Strike, Zone has included a screen. Nowadays, children grow up familiar with touchscreen devices. Laser tag is about the experience of another reality, an immersive game. It’s essential to know how well you’re doing at any given time in a game – that’s why all computer games give you a score, a rank, a game time. Some companies insist that competitive players drive away business, but that’s simply not true. Around the globe, hundreds of leagues are successfully run every year, running on quiet nights, encouraging repeat play and a reliable income. Some companies would have you believe that the size and colour of the laser makes no difference to the laser tag experience. 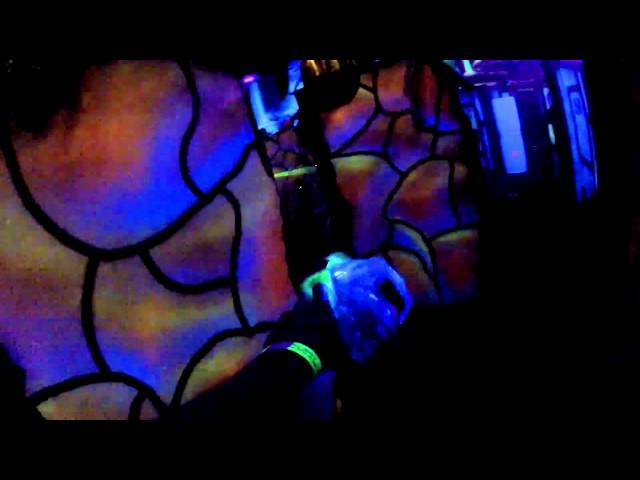 It’s in the name: having the best, brightest laser is essential for laser tag. Players want to see where they’re tagging, and they want to see their laser. Here at Zone, we don’t shy away from giving the customer what they want: laser tag. Zone once again leads the industry with the largest laser of any manufacturer. We pride ourselves on innovation, and giving the consumer the greatest experience. That’s not at any sacrifice of safety: Zone’s lasers exceed all safety regulations. Don’t believe the alternative facts. Players love Helios Pro’s FAT 13mm laser beam because it’s bright and brilliant. It brings the game experience alive with lasers flying everywhere – just as it should be. Don’t believe the alternative facts. Not every laser tag pack is the same. Be sure to try them all on before deciding, and you will see for yourself why Zone is the industry leader. There is one ‘alternative fact’ narrative that we cannot stand to hear: that Zone is an unreliable product. It’s time to put it to rest. This assertion is not only false, but absurd. Zone is by far the largest global manufacturer of laser tag products. We have sites still running and making money with 20 year old equipment. It’s simply not possible for us to survive with an unreliable product. “As long as it shoots lasers, the players won’t care.” We hear this from time to time and it couldn’t be further from the truth. Players crave an immersive, exciting, diverse and fair game experience—when you provide that, they will come back time and time again. © 2017 Laser Tag Facts. All Rights Reserved.